Zakk Wylde's Black Label Society brought their Unblackened tour out to Grand Junction Colorado, it's a four hour trek west here from Denver and it was totally worth it. As this is just a short tour here in the month of April across the states, then it's off to Europe where they will take this special show to the masses. Supporting their Unblackened album which is a little more subtle offering of previous tracks from Zakk's enormous catalog dating all the way back his 1994 album Pride and Glory. These semi stripped down versions really showcase not only showcase the versatility of this powerful band but the longevity and timelessness of their music. As a teenager Ozzy Osbourne and his ability to cultivate guitar icons has always enthralled me. As I have been following Zakk since Ozzy's No Rest For The Wicked, hearing these songs brought me back to a simpler time in my life. And as a homage, I created a one of a kind collage poster of Black Label Society consisting of pictures that I took as far back as 2005 all from The Ogden Theatre in Denver CO. Great friends Ed Sandoval and Joseph Sanchez provided me with experience to meet the guys of BLS. I gave one poster to the band and one was signed for me. Truly a humbling experience to be able to share my art with others who's art has moved me. Big thanks to my Denver /Pueblo BLS family that made this experience possible. 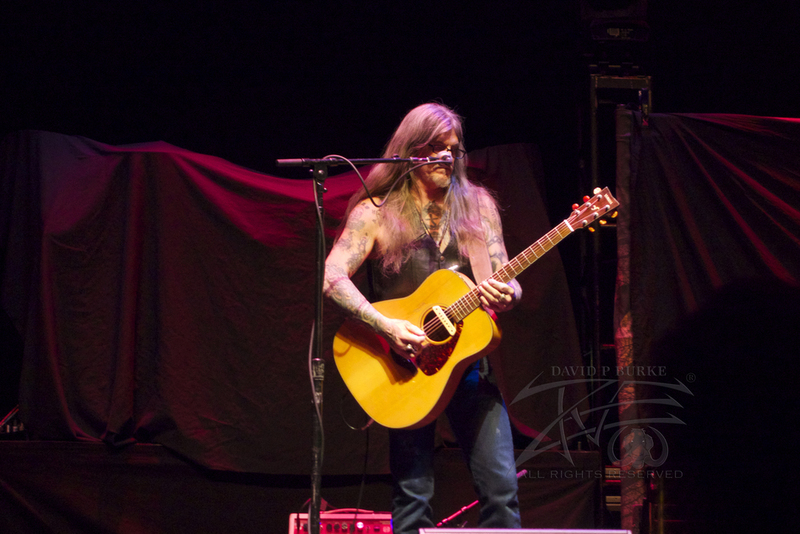 In Grand Junction's beautiful Avalon Theatre, The Show started with Wino (Scott Heinrich) who was armed with an acoustic guitar and plenty of attitude. Weinrich is best known for being the frontman and guitarist of the doom metal bands The Obsessed and Saint Vitus. Also a solo artist he has released three studio albums since 2009. His set was quick but on fire and he soloed and shredded our ears especially when he added distortion to his unassuming ax. Very appropriate way to open the show. With the crowd now ready for the Doom Crew to take the stage as the BLS curtain dropped they opened with Zakk's 1994 album Pride & Glory opening track Losin' You Mind. We went nuts. The show had all members sitting in chairs through the entire performance but make no mistake the entire audience was unchained. Playing songs from not only the BLS albums they dug deep and performed flawless versions of songs from not only Pride & Glory but also from Zakk Wylde's 1996 solo album Book of Shadows. Zakk effortlessly played on the patio and his new personal line of guitars and sound products Wylde Audio. Even sitting down his presence is unmistakable. Bassist and longtime BLS member JD DeServio was having a blast. As he was smiling and interacting with the audience while his bass sound was not overpowered by the guitar onslaught that is Zakk. Drummer Jeff Fabb was also having fun on stage as he set the tempo with his enormous drum sound. An incredible drummer and extremely versatile his sound is unmistakeable. Guitarist Dario Lorina has enormous talent as he can not only keep up with Zakk but he also has a great voice and switched off with Zakk on the piano and guitar. His effortless style and performance is a great addition to the BLS family. This was truly a night I did't want to end. We were all hypnotized from Zakks blazing solos while he even played behind his head and using his teeth. A highlight was their acoustic version My Dying Time from their 2014 album Catacombs of the Black Vatican. JD, Jeff and Dario played a very dynamic and thumping performance while Zakk soloed like his namesake. As the show concluded we all left the venue exhausted and charged at the same time. Looking forward to next time to see the Doom Crew live again.